It’s not easy to be a green consumer. Even though environmentally-friendly products are becoming more widely available, many of the things we use in our daily lives are produced in unsustainable ways, and too often, when we’re done with them, they end up as garbage, or as clutter that causes us stress. 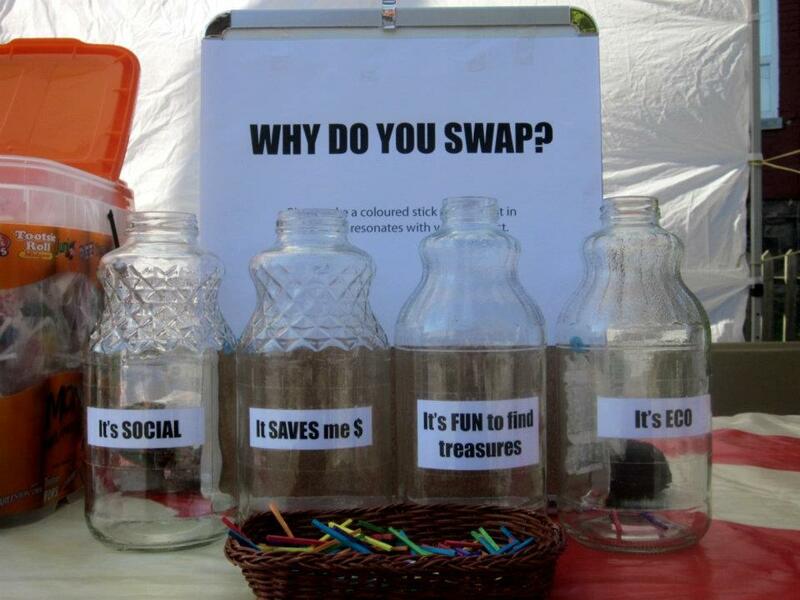 There’s another way to buy less stuff, produce less waste and save money while still getting things we need: swapping. Swapping is an ages-old tradition that’s gaining new ground as people realize they can exchange what they no longer want for things they can use. There’s now an online community that’s making it easier for people to swap: Swapsity. Swapsity allows you to exchange things like clothes or toys your kids have outgrown for bikes or a tool set, for example, or turn that fancy juicer you never use into a weekend cottage get-away. Past swappers have traded wine glasses for a book, craft supplies for a DVD set, planter and notebook, and even kitchen renovations for a car. As well as stuff, you can swap skills and services on Swapsity. If you’re a savvy gardener or know another language, you can share your knowledge with someone else, and in return get those guitar lessons or that e-bike you’ve been dreaming of. If you run a small business, you can trade goods or services, such as your excess organic produce for web consulting, or personal training for marketing advice. You can browse or view available items on Swapsity’s website. To participate, you sign up on the site (it’s free), list the things you own that you’d like to trade, and add the things you’d like to find, and Swapsity will generate swap matches based on your location. You can send messages to others through the site, and after you’ve reached agreement, you exchange items (usually in person or by mail). Swapsity has a feature you can use to keep track of what friends and other trusted swappers are swapping, and the site provides information and safety tips. You can find out more and get started at http://www.swapsity.ca/barter101. Swapsity also organizes swap events. So far, these successful events have been focused in Toronto, but Marta tells me they are open to organizing more events in other cities, including Ottawa, if there’s enough interest and some volunteers to help out. Giving away your used stuff is one way to recycle it, but what I like about swapping is that it places value on what you’re offering up, and what you have goes to someone who really wants it—you’re not just passing on your trash. Swapping is also a way for individuals to make small changes that can add up. You can check Swapsity out at their website, on Facebook and on Twitter. Swapsity welcomes volunteers, so if you’d like to see more swapping happening in Ottawa online or through events, you can contact them at volunteers@swapsity.ca.